Two medical professionals recently trekked through Helambu, seeing the work our local team are doing first hand in a series of walks through the valley. If you’ve missed it, catch up on Part 1 and Part 2 of their story. This walk was thankfully less strenuous and mercifully less sunny than the day before. We wove around the beautiful hills, frequently crossing cooling streams and namaste-ing our way through sleepy villages! We saw the school and plunged downhill into a forest onto a seemingly never-ending and uneasy path. 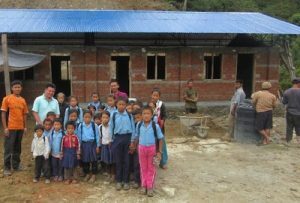 We eventually emerged at the construction site, where eight classrooms for 75 kids are spread across two buildings, on a painstakingly machine-levelled plateau. The men were currently concreting the wheelchair access ramps, and classrooms were near completion, just needing the partition walls to be put in place. There is still a lot of work to do on other elements of the complex, including the toilet block which has yet to be planned and built, and lots of debris has yet to be removed from the playground. We were given lunch, washed down with corn beer while we met some of the teachers, who were very excited about their fantastic new school, before the last leg of our journey. The hills we walked through on our way to Ichowk were speckled with heaps of houses, shrines and stupas, each a devastating reminder of the earthquake. On top of this damage, the monsoon rains (through which we were walking) wash away roads and cause landslides that block the way for vehicles. 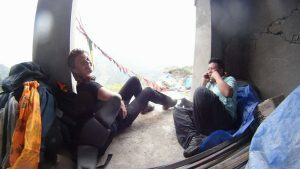 We sheltered from the heaviest of the rain in goat sheds and in a monastery, which was sadly not even finished last year when it was damaged beyond repair by the disaster. Jimmy had hoped to stop by and check on a 14 year old girl that he had sponsored, but when we arrived her uncle told us that she was no longer living there, having been married. This has worrying connotations, as girls are still often exploited and sold off from these areas, and highlighted the struggles of local girls and women in rural Nepal.